Back in May, the Sydney Morning Herald (SMH) announced its Best Young Australian Novelists awards. They have been doing this for 17 years, though I only became aware of them a few years ago. They are usually announced at or to coincide with the Sydney Writers Festival. The judges this year were Marc McEvoy, SMH Literary Editor Susan Wyndham and Melbourne author Kristin Krauth whom I’ve only become aware of through the Australian Women Writers Challenge. To be eligible, writers have to be “35 years or younger when their book is published”. So, the award is called “Best Young Australian Novelists” but it is apparently granted on the basis of a specific book. Romy Ash whose Floundering was short-listed for this year’s Stella Prize, Dobbie Literary Award, and Miles Franklin Literary Award, among others. An impressive achievement for her debut novel. She has also written short stories, and I’ve read one, “Damming”, which was published in Griffith Review Edition 39. I have not, though, read Floundering. It apparently explores “the menace of a hostile landscape”. I’m fascinated by the fact that the outback continues to be a significant presence or theme in Australian literature. Ash argues that while writing about the outback may seem a cliche, the point is that much of Australia is “not benign”. That surely is the point, and is what makes it so rich with dramatic possibility. Paul D Carter for Eleven Seasons which won the 2012 Vogel Literary Award and was shortlisted for the UTS Glenda Adams Award for New Writing in the 2013 New South Wales Premier’s Literary Awards. The novel is apparently about “boys obsessed with football and the men who live by its rules”. Sounds like one that would be interesting ro read in the context of Anna Krien’s Night Games which I reviewed last month. Interestingly Carter’s day-job is teaching English in a Melbourne girls’ school. 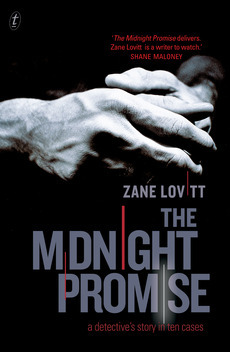 Zane Lovitt whose Midnight promise I have – woo hoo – read and reviewed here. It’s more a collection of interconnected short stories, but there is a loose narrative thread running through it following the career of its private detective protagonist. Emily Maguire for Fishing for tigers. Maguire, unlike most of the winners, has quite a few books, including three other novels, to her name, and has won the Best Young Australian Novelist award before. She teaches creative writing, and it sounds like she’s well qualified to do so, doesn’t it? Fishing with tigers was inspired by Grahame Greene’s The quiet American, and is about “divorcee Mischa Reeve, 35, whose affair with Vietnamese-Australian Cal, 18, upsets her friends, including Cal’s father, Matthew”. Ruby J. Murray whose Running dogs was, like Carter’s Eleven seasons, also shortlisted for the UTS Glenda Adams Award for New Writing in the 2013 New South Wales Premier’s Literary Awards. I hadn’t heard of Murray, I must admit, but this book sounds interesting. It’s set in Indonesia, which is a significant country for Australia, and like Maguire’s Vietnam-located Fishing for tigers, it is about an expat Australian aid worker. Murray, who worked in Indonesia in 2009, was horrified at how little Australians knew (know!) about Indonesia despite its importance to us economically and politically, not to mention being a major holiday destination for Australians. Majok Tulba for Beneath the darkening sky. It, like Maguire and Murray’s books, is set outside Australia, in this case, in Sudan. And, like Romy Ash’s Floundering, it was shortlisted for the Commonwealth Book Prize. It’s narrated by an 11-year-old village boy and is “about child soldiers in Africa”. It’s fiction. Tulba says he used some experiences he and his brother had, but he was not himself a child soldier. Apparently Sudanese rebels tried to recruit him but he “failed the test – he was shorter than an AK-47 assault rifle“! Lucky him, eh? They sound like an interesting bunch of authors and books, don’t they? And, I’m rather intrigued that half of them are not set in Australia, which reflects our increasingly multicultural society. It’s good to see our literature recognising this. In 2012, only three awards were made – Melanie Joosten for Berlin Syndrome, Jennifer Mills for Gone (which is waiting patiently in my shelves to be read), and Rohan Wilson for The Roving Party. Past winners have included Nam Le, Christos Tsiolkas, Chloe Hooper and Markus Zusak. As you say, this sounds like a broad list reflecting the best of Australian creativity. Interesting to read that Nam Le, Chloe Hooper and Chris Tsiolkas are former winners. And more people to read, eh, Catherine? I do love the variety. LOL Guy, I think he’s over 35 now, isn’t he!! I did hear him mentioned the other day … But I was called off to something else and didn’t catch the point. I read and reviewed Dogs Running finding it well-written, but not my favorite kind of books. Glad to learn that Jennifer Mills was honored for Gone, sent me from the publisher as an award. I found it very impressive, if also about a subject that I tend to avoid. Oh, how did I miss that review of an Aussie, Marilyn? I really must get to Gone … I don’t think I’ve heard a negative thing about it. I love that “young” means “under 35”. I’ve got time. Not so much to become a best novelist, just… in life in general. I’ve got time. Wow. That had nothing to do with your post. Oops. We’ve all got time, Hannah … Just some more than others. You’ve got plenty … Use it well! Thanks for a useful summary of these books. In my review of Running Dogs (on my blog) I was so excited to find a readable novel by a young Australian set in Indonesia that I think I went over the top about its merits. I was there during one of the periods in the book – the 1997 elections – and she really captured what it was like to be in the midst of that wild time. My only criticism was that the the expat character is insipid, so that I was unable either to like or dislike her. Oh, you’ve read it too Bryce? I can understand being over-enthusiastic about something that’s a change from the norm. She’s still a young author so although you and Marilyn have some reservations, she’s clearly worth giving a go and will hopefully go on to more. What an interesting variety of books on the list! And how exciting too that they are all such young writers with so much talent. Floundering sounds intriguing as does Beneath the Darkening Sky. Thanks Stefanie. Does the US have any best young none list listings or awards. I know Granta does it in England.